What is it? At the market, you'll spot the spears of asparagus tethered together in bundles. Thin, green, flute-like stalks are crowned by a tight clump of buds, which themselves look a bit like scales and may be tinged in purple. The vegetable we eat is actually a shoot from the asparagus plant, a member of the lily family. Asparagus signals the coming of spring, and it's at its best in April and May. What is it good for? 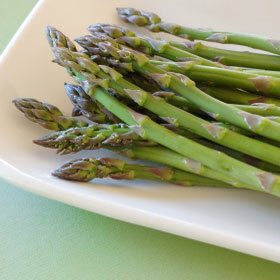 Similar to many greens, asparagus is high in blood-supporting vitamin K and antioxidant vitamins A and C. But compared to other vegetables, asparagus has a unique nutritional profile. Thanks to a combination of minerals and an amino acid called asparagine, asparagus has a diuretic effect (it makes you pee more - and it's famous for the rubbery smell it gives to some people's pee). Asparagus also contains a carbohydrate that boosts the body's healthy gut bacteria, and is a great food source of folate, a B vitamin that is crucial to healthy red blood cell production. What does it taste like? Succulent, juicy asparagus has its own distinctively green, earthy, mellow flavour. Like green beans, asparagus tastes great sautéed in butter. Steam the spears and eat them as a side dish with lemon or chop them into a pasta or omelet. Asparagus goes nicely in side and main dish salads, casseroles, even puréed. You may also be able to find white asparagus, usually canned, which has a more delicate flavour and even more tender texture. The stalks of purple asparagus are shorter and its flavour is fruitier. It's best to eat asparagus soon after purchase. If you must store it, keep the ends wrapped in damp paper towels and stow it in the back of the refrigerator. Light, heat, and air can sap the vegetable of some its nutritional benefits.